Around a year ago I got a drone, and did the right thing and did training, passed a flight test, got insurance, and got (or rather A&A got) a PfCO from the CAA to allow commercial drone operations. As a company we do like to dabble, and have been involved in many interesting ventures like this over time. Even so, we have not pushed this a lot and in spite of several enquiries we have not managed to sell any commercial drone operations this year. Which is a shame. The one operation we ran internally involved a slight incident with a tree sadly. The insurance was good and paid out. Even so, not all ideas have to be an immediate success. Our engraving business took around two years to pay for itself. Our 3D printing business is getting close to paying for itself. Our card printing stuff is actually picking up nicely now. Many of these sidelines are also useful in the business (e.g. we engrave front panels for FireBrick FB6000s we make, and use some 3D printed items in the office, and print cards for routers we send out, etc). 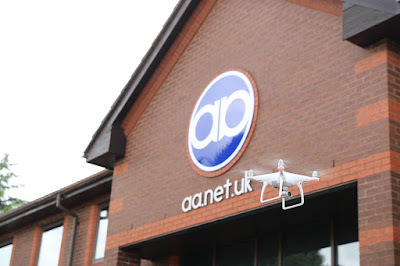 We have used aerial shots of the office as well, for the business. However, I have decided that we won't renew the PfCO and insurance. I have not taken the aerial photography off the web site, on the basis that if we do get a reasonable job we can renew the PfCO and insurance. It is a bit of a shame really, and I largely put it down to a degree of over regulation. I appreciate a lot of the rules are for safety, and that makes sense. But a lot of the rules are not - e.g. one can fly a drone without camera (which is just as dangerous) in many more places than one with a camera. The real bummer for me is that even after the training and the tests and the permission and getting the insurance, I cannot even simply take aerial shots of my house! To do so would mean getting permission from several neighbours, some of which are not going to give it (we do have at least one rather odd neighbour). Now I appreciate that allowing someone to pop to the Apple store, get a drone, and start flying around is not very safe, but I have had the training and got the PfCO and insurance. I understand the DPA issues. I can quite safely fly a drone over my property without flying over my neighbours (although I am allowed to if over 50m even without their permission, the problem is taking off and landing!). So why make the rules so restrictive and nonsensical? It is crazy. If I can't even do that simple thing, a shot of my own house where we were having work done in the garden, how the hell can we sell services to people? I'd like to see the rules changed. Yes, make drones identifiable and pilots accountable and insured, that is all fine. Have a test you need to pass - that is fine. It is not different to driving a car. But I don't need my neighbours permission to drive passed their house, for dogs sake! If you turned the camera off during takeoff and landing would that avoid the need to seek permission from your neighbours? We did wonder about that - but I suspect it is a rule we don't really want the CAA to test in court! Maybe you can take it on your next cruise, with permission from them, and do some promo footage for them flying towards and over the cruise ship. I bet that would look great! The house opposite here has a drone, it was flying over all the gardens a few days ago. No idea if it has a camera, it's a small black thing maybe 15 inches across. It took off and landed at the front of the house, so out of view of the gardens, which makes me think it does have a camera as the operator wouldn't be able to see it from the front of the house. Plus it was hovering over gardens and was over mine for a minute semingly watching me talking to the neighbour pointing at it. If it keeps at it I'll go round there and ask them about it. Very interesting and some good points made. I think it is fair to say we are now in 'phase one' of drone regulations and things will move on. I have already noticed the change of people from 'drone histeria' to people realising that drones are here to stay and have a lot of positives. After some enterprising people actually LANDED a drone on the UK's biggest white elephant (£3bn aircraft carrier with no aircraft for the next 5-10 years) you should all expect regulation to get MUCH tighter. As an aside MoD has a RFQ out for what sounds very much like a system to disable/kill drones out to 20km in ALL environments (urban/rural/sea/whatever). Horse & stable spring to mind but it is the MoD we're talking about - well TBH its BAE Systems as they've effectively "run" procurement at the MoD since the first Gulf War. Due to cutbacks in defence spending a lot of the companies who previously provided missile tracking, guidance and defence have scaled it down to cover smaller and easier targets. Disable and kill the drone is not the only plans for lots of these solutions. It's track n trace operators and neutralize the threat. Agreed. One obvious use is flying down your street checking if roof tiles have blown off or gutters are clogged. Can't even do that with insurance and risk assessment. I would say however that the BBC seem to fly wherever they like, over crowds, over london. Surely not operating within the current laws and yet not challenged. Could you actually get more leeway with your pfco than you realise? Well possibly, but you don't know the BBC are not operating within their PfCO. That is one problem as every one can be different and so how do you report someone when the rules are individual. If you have 6 or more rotors then you have redundancy which means you are then able to get permission for flying over crowds even. Not sure if https://en.wikipedia.org/wiki/Kite_aerial_photography is regulated in the same way - if not it could be a way of getting the photos you want.